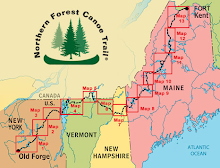 North Bounders hiking from Georgia to Maine (I am a SOBO) are starting to pass me on the trail. They are all Young Men, extremely focused, walking and eating machines. For them, the trails end is only day's away. They hike in one day what takes me two - or more. These folks started hiking during the second half of February - still winter on Springer Mountain (the southern Appalachian Trail terminus). They are the "best of the best". One can only respect and admire them... and hope to reach their level as soon as possible.